Two US class action lawsuits against Facebook by shareholders alleging it hid growth concerns ahead of its 2012 public listing can now go ahead. A federal judge certified the legal proceedings, Reuters reports, saying investors who claim they lost money could pursue their claims as groups. Facebook told the BBC that it was disappointed with the decision and it has launched an appeal against it. The firm’s initial public offering (IPO) in May 2012 raised $16bn (£10bn). The investors say that by purchasing the firm’s shares at inflated prices they lost money. That year, its shares began trading on 18 May in New York at $38 per share, but the price fell to almost half the amount of $17.55 on 4 September. The price stayed below the IPO price for more than a year, but shares ultimately rebounded and closed up at $107.26 on the Nasdaq index on Tuesday. District judge Robert Sweet gave the lawsuits class action certification on 11 December, but the order was made public on Tuesday, Reuters reports. Investors claim that Facebook omitted information about revised revenue projections and the impact that increased mobile usage, at a time when there was little advertising on mobile devices, would have on its revenues. But Mr Sweet said Facebook provided “an impressive amount of evidence” to indicate that shareholders knew how mobile usage would affect the firm’s revenue. However, he rejected the tech giant’s argument that shareholders should pursue their claims individually. In a 55-page decision, Mr. Sweet said that given the extraordinary size of the case, allowing two subclasses “in fact adds more weight to the predominance of common questions and answers, practically negating the individualized questions raised”. Facebook told the BBC that it believes the class certification is “without merit”. The tech giant also said the decision “conflicts with well-settled Supreme Court and Second Circuit law”, and it has already filed an appeal seen by the BBC. “The suggestion that class members’ knowledge might be inferred on a class-wide basis flouts due process,” the appeal said. The UK is the world leader in e-commerce, former Google boss Eric Schmidt has told the BBC. Now executive chairman of Google parent company Alphabet, Mr Schmidt said there was no reason why a hundred billion pound tech start up could not be launched in Britain. He said UK entrepreneurs tended to sell up earlier than their US counterparts. But he said the lesson from the US was that when tech companies run, they can become “very, very big. If you have a strong franchise that’s growing quickly, you’re probably better off waiting a while [before selling],” he said. This lesson could “easily be learned in Britain”. Speaking to BBC Radio 4’s Today programme, Mr Schmidt said that “Britain is the leader in e-commerce in the world, far ahead of the United States. He added there were no barriers to launching “a European-scale corporation that is larger than a US-scale corporation”. Mr Schmidt said the key to any successful start up was the product. “The only thing that matters is the product quality,” he said. And in the age of social media, “lean distribution models are replacing big marketing and advertising budgets”. This means start ups can compete more easily with more established, big companies, he argued. “If you have three people and a vision, you should be able to raise funds from friends and family, crowd-funding and early venture groups,” he said. The key, however, was having a “strong engineering lead”. Without someone with a vested interest in the company to build the app or technology product, start-ups tend to struggle, he said. Having someone in-house, rather than going to a third party developer, is vitally important, Mr Schmidt said. London is a massive city containing in excess of 5 million dwellings. In this overcrowded and often noisy environment it is essential that robust acoustic design is incorporated into all new and refurbishment projects form the offset. To help enforce good acoustic design principles pre completion sound testing was introduced July 2003, this resulted in all new build properties and conversions which were built after this date are require 10% of each party wall/floor construction type to be tested. Sound insulation Testing is carried out between pairs of rooms separated by party walls or floors. The two ‘habitable’ areas that usually require sound testing are living rooms and bedrooms, although other rooms can be tested if this is not possible, i.e. kitchen to bedroom. We offer Acoustic Site Survey Visits to let us view the existing site construction. This allows us to check for potential problematic areas such as lightweight blocks haven’t been used in the existing construction. It also lets us check that the installation teams are installing the acoustic materials as per manufacturer’s guidelines, thus avoiding crucial onsite mistakes. In our experience a sound test failure is often due to the poor workmanship rather than the actual design. The site survey visits negate the risk of sound test failure. We also undertake sample sound testing of the existing construction. This offers an accurate overview of the acoustic performance of the existing partitions which enables us to offer an acoustic design which correlates with the existing construction. Avoid using lightweight blocks in the inner envelope construction as sound will travel along light block-work both vertically and horizontally from dwelling to dwelling. The use of resilient suspended ceilings will help improve the performance of the floor partition. Use a high quality resilient acoustic membrane on top of the floor to improve the impact performance of a floor. Ensure all penetrations are fully sealed where they terminate through floors and they are adequately boxed with acoustic quilt and two layers of plasterboard. Defect Diagnosis & Remedial Advice With over 30 years’ experience in building acoustics, we are able to diagnose the reasons for the sound test failure and recommend a cost-effective solution. Often, the reasons for the partition failure are obvious to the test engineer in which case the advice will be minimal and subsequently the cost for acoustic design advice will be minimal. Sometimes, there are more technical issues which require more detailed diagnosis and invasive investigation, such as large amounts of noise flanking due to serious design faults, e.g. the use of lightweight blocks in the construction of an apartment development. Whatever the problem we can usually find an acoustic solution that will satisfy Part E of Building Regulations. If you have a project that’s needs acoustic design advice or needs sound insulation testing then please contact us at via the APT Sound Testing Website or phone us directly on 0203 669 2650 and we should be able to offer you an expedient acoustic solution to help you achieve practical completion. Business owners: have you Googled yourself lately? If not, do it now. Go on, type in the name of your business and see what comes up. If the name of your business is Joe’s Auto Repairs, then your search will likely bring up Joe’s Repair Shop (Surrey), Joe’s Auto Body Care (Chester), Joe’s Automotive Ltd. (Towcester), Joe’s Car Repairs (London) and perhaps also a smattering of like-named businesses in America. Which business is yours, and how do you get people in your area to come to your shop and not to some other Joe who does auto repairs? Well, you don’t need to come up with a more unique name for your business, but you do need to learn how to use search engine optimisation, or SEO, to make your company stand out and for promoting your business to the vehicle owners who are most likely to come to you for repairs. The Following are three ways in which SEO can draw interested clients to your website and, ultimately, your shop. Your target audience is searching online with specific keywords and key phrases that are relevant to your business, whatever that may be. You need to know what those keywords and key phrases are, and Internet marketing companies have the ability to research that information for their clients. Tap into that resource. The major search engines rank websites, in part, according to how prominently certain keywords figure in the website’s content. More specific keyword searches will set your business apart from the competition and result in higher rankings, which translates to greater visibility for your website and, ultimately, more sales. Yet another opportunity for enhancing your online presence is through social media. If you already have a website, then you should also have a Facebook page and Twitter feed. Even businesses with stale websites are able to keep in touch with current and prospective clients by posting and Tweeting on a regular basis and interacting with their target audience. If you know which keywords your clients are using to find businesses like yours, then it pays to make use of them in your posts and elsewhere. Best of all, your Facebook page, Tumblr account and whatever else you’re using to stay in touch with clients get their own separate rankings in search results. In other words, one can keep you front and centre even when the other does not. As impressive or even overwhelming as they may seem, these considerations are simply scratching the surface when it comes to Internet marketing and SEO. Direct Submit Internet Marketing Services can do all this and much more to increase traffic to your website and generate interest in your company. Direct Submit works with businesses of all sizes to develop effective SEO marketing campaigns that deliver lasting results. If you want to be sure that your company’s website has the best possible chances of success you might want to consider hiring an expert service such as Direct Submit to help you create an internet marketing strategy that is certain to ensure that your website is seen in all the right places and by all the right people, helping your internet based sales and leads begin to grow in no time at all. By implementing strategies such as Search Engine Optimisation (SEO) at Direct Submit they are able to your ensure that your businesses website will be seen by the people that are already looking for services or products that you provide. By making sure that your business appears higher up on the pages of results produced by search engines such as Google or Yahoo, people will be far more likely to see your site and click through to your page, increasing the amount of relevant traffic that your website receives. Making sure that your page can be found by potential customers and investors is essential if you want your online business to grow, no matter how small or large a company is if their website is difficult to find it is unlikely to be a success. Effective SEO requires ongoing motoring and maintenance along with expert knowledge making it a time consuming and complicated process, although when it is carried out correctly the results can really pay off. So if you are a new business or your existing website isn’t performing as well as you would like contacting a company such as Direct Submit could be a really worthwhile investment. Their friendly team are always on hand to help you plan an internet marketing strategy that is completely suited to your company’s individual needs and implement it to the highest standards, not only saving you a lot of time and effort, but also boosting your internet sales far more quickly than you may think. By employing an expert service such as Direct Submit you will be able to have more time to get on with other work to keep your business growing while they make sure that your website really works for you. With a focus on paying attention to detail and providing every client with the right advice so they can help them build an SEO strategy that is completely suited to the needs of their business, they pride themselves on offering the best possible service to every business no matter how small or large. With each stage of the process being carried out by one of their team of fully trained staff including key phrase research, website analysis and compliance, SEO promotion and marketing, linking strategy and ongoing monitoring and maintenance you can be certain on having expert advice and support every step of the way. For more information on making your website work harder for you, or you would simply like to discuss your Internet Marketing or Search Engine Optimisation project, call us today on 0845 2722350 or visit the Direct Submit website. Have you ever wondered how you could possibly keep up with your young children or felt as though they simply had “too much energy”? Is it hard for you to get them to sit still when the occasion demands it? As a parent, do you sometimes feel confused about what’s best for your child or simply too tired to provide all the activity your child needs? The Problem: Too Much of This, Not Enough of That We hear a lot these days about the childhood obesity epidemic and the likelihood that children today will, for the first time in history, have a shorter life expectancy than their parents. The reasons behind the childhood obesity epidemic are glaringly obvious: overexposure to nutrient-poor foods high in sugar and sodium as well as excess “screen time” (spent in front of televisions, computers, tablets and video game consoles) resulting in sedentary lifestyles. As parents, we often want our children to have all the advantages that our parents did not and to benefit from advanced technologies that were not yet around when we were growing up. Too often, though, providing our children with “all the advantages” – even by driving them to school when they could easily walk or ride a bike – does a huge disservice where your children’s fitness for everyday activities are concerned. The Solution: Unleash That Energy! While “too much energy” may pose an inconvenience for busy, fatigued parents, it is of the utmost importance that your child be given every opportunity not only to expend energy and be physically active, but also to develop sensorimotor skills that she will need throughout life. Working with computers, tablets and other electronic devices can actually help your child to develop fine motor skills in ways that unstructured play might not. However, problems arise when parents use such tools to “babysit” their children or to spare themselves the physical ardour of playing and “keeping up with” the child who has “too much energy”. It is generally agreed that growing children and adolescents need a minimum of 60 minutes of daily physical activity. Many different sports, unstructured play and other activities can meet this requirement; even dancing, hula-hooping and games such as tag, duck-duck-goose and hares and hounds are great ways not only to keep your child physically active, but also to help her to pay attention to details and have a greater awareness of her surroundings. Physical activity is most beneficial when your children actually enjoy what they are doing and don’t have to be coerced into participating. To the extent possible, allow your child to choose the activities that she will participate in or ask her what types of activities she would like to do on a regular basis, such as in a class with other children her own age. KidzRFit offers age-appropriate physical activities for children of all ages at schools and in community settings throughout Britain. All of our children’s health programmes meet the EYFS standards and include both physical activity and nutrition education in a fun, supportive environment. Let our teachers bring out the best in your child and help her to develop her abilities and talents to the fullest! For more information about how our programmes can benefit your child, call KidzRFit today on 0191 4387632 or visit the Kidz R Fit website today. Bathroom upgrades are among the most beneficial cost-efficient home projects: they make the space more enjoyable for you and your family in the short term and increase your home’s value in the long run. Before taking on such a major home remodelling project, however, it is important to plan out what you want very carefully, either on your own or with the assistance of your chosen bathroom supplier. When upgrading small bathrooms, making the best possible use of limited space is key. Fortunately, a wide range of sleek, classic yet modern fixtures are available which will brighten up the space and provide that clean feeling that everyone wants out of a full bathroom – without taking up an inordinate amount of space. Shower cubicles without doors, such as those available from Matki showers, are an effective way to create an attractive, open space in which people will not feel cramped every time they walk in. These days, another consideration is environmental friendliness. If you’re a homeowner, it’s simply no good to underpay for an average-quality shower head and then be faced with exorbitant water bills each month – especially if you have a family or other people living in the home besides yourself. On the upside, the cost of producing higher-quality, environmentally friendly shower fixtures has come down in recent years, and with “green” products now being more sought-after than ever, they are very likely to fall within the price range of someone seeking to renovate bathrooms of any size and for any number of people. 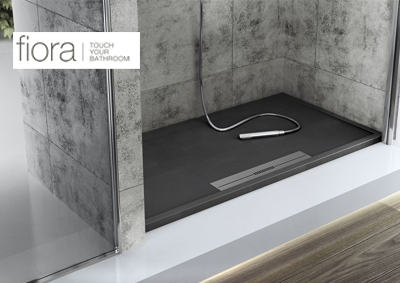 If eco-friendliness and cost savings through increased efficiency are concerns for you, then consider installing a shower head from the product ranges of Fiora showers or Hansgrohe showers. A final consideration is how the bathroom décor will all come together. While a wide range of shower heads and other bathroom fixtures are available in bright and shiny silver or glossy white or black, it is equally important to your home’s resale value that everything – walls, fixtures and all – fit into the same overall colour scheme. To that end, it is wise to choose a conservative palette of white, off-white, light blue or black for your bathroom walls. Bathroom upgrades can be complicated, particularly when undertaking them for the first time for a small bathroom or in an older home, but they needn’t be. With a clear vision of what you want out of the space, you can easily turn a bathroom of any size into one of the most attractive rooms in your house. P.T. Ranson has been providing branded bathroom supplies and service for bathroom remodelling projects for years. With more than 30 years of collective experience and a commitment to providing the best possible products and service for each individual bathroom remodelling project. When buying online from P.T. Ranson, deliveries on the UK mainland are free of charge. For more information, call today on 0191 4696999 or visit the P.T. Ranson website today. So your small, local business is up and running, and you have a website with basic information about who you are and what you provide and when. But does your target audience know your website exists? If not, then the awkward question arises: how do they know your business exists? The benefits of local search engine optimisation are more specific to brick-and-mortar shops than to Internet-based companies. It is important for any firm with an online presence to use SEO to their advantage; however, for local businesses, local SEO can make the difference between potential customers in your own neighbourhood coming into your shop to buy a product and ordering it on Amazon. Likewise, if you own a restaurant, you want the people who live and work in the surrounding area to be able to view your full menu online and know your days and hours of operation; otherwise, they may very well pass you up for the corner McDonald’s and settle for food that they might not even want, simply because they knew what to expect from McDonald’s but not from your establishment. And how do you go about drawing traffic to your website in order to boost sales, you ask? Simple: through informational online content designed specifically to increase traffic to your website by making your website figure more prominently in Internet search results for certain keywords and key phrases. To continue with our restaurant example, let’s say that your restaurant in the city of Newcastle specialises in vegetarian cuisine, and you would like to bring this to the attention of people living in your town as well as any vegetarians who might be in Newcastle on business or for a family visit. By providing online content using key phrases such as “vegetarian food Newcastle,” “vegetarian restaurants in Newcastle” and “vegetarian-friendly restaurants in Newcastle,” your website will very quickly rise to the top of Internet search results for these phrases. And when your establishment is among the top three results, the odds favour your potential clients becoming actual ones. Direct Submit Internet Marketing Services Ltd. is a UK-based Internet marketing agency providing SEO services to organisations across the UK. Our mission is to position our client firms as favourably as possible among the competition in an ethical manner by developing highly effective Internet marketing campaigns and the type of reliable online content which fosters trust among your current and future clients. It’s no secret that kitchen and bathroom upgrades do more than almost any other cosmetic home improvement project to increase its attractiveness to prospective buyers, effectively allowing the house to sell itself. If you live in a decades-old house with a relatively small bathroom, you might be thinking that there is little that can be done to make such a small space more attractive to potential buyers. If so, think again: interior designers are experts at making small spaces seem bigger, and bathroom furniture and supply companies carry products for bathrooms of all sizes and are typically able to assist homeowners with both small-scale and large-scale bathroom upgrades. If you consider your bathroom to be small and cramped, let a professional work with you to figure out what would be the best possible use of the space. If a bathtub you never use takes up a substantial amount of floor space, then one of the first things you should consider doing is ripping out the bathtub and replacing it with a more compact shower cubicle. A shower cubicle with glass walls and door show whoever walks in the size of the bathroom, thus opening up the space. You might also find, even if you don’t have immediate plans to sell, that the shower cubicle makes for a warmer shower since it retains steam within a smaller space for the duration of the shower. There’s nothing more dreadful than feeling the warmth of your shower going straight up and away, or out through the spaces between the shower curtain and the wall, before you’re even done showering! P.T. Ranson carries a wide range of products for luxury bathroom upgrades, including Matki showers, Hansgrohe showers and much more. No matter the size of the space you’re working with, our consultants can help you with a design that includes fixtures and features to suit the current dimensions of your bathroom. A bathroom remodel is a major investment in your home, after all, and we want you to be certain that the sum you invest today will result in a new look for your bathroom that you will love for years to come and that will leave you in a good position to sell if you ever decide to do so. For more information or to request an initial consultation, call us today on 0191 4696999 or visit the PT Ranson Designer Bathrooms website. Even though autumn is here and winter will soon be upon us, it’s still not too late to consider replacement windows throughout the home. For some homeowners, the decision isn’t about whether it’s time to replace the windows (in many older homes with the original windows, the answer is a resounding “yes”) but what to do next. Some people might worry about their decision being determined by the window treatment options available for the windows they are interested in as replacements. There is no reason to let this be a limiting factor, because a number of reputable companies offer made-to-measure blinds for unusually-sized or unusually-shaped windows in the home and conservatory. You might be thinking that for both windows and window dressings, you’re limited only to the inventory available at your local home improvement shop, but nothing could be further from the truth. It is becoming more and more common for homeowners to custom-order everything for their home from windows themselves to luxury bathroom upgrades. If you’re interested in a particular type of window that you think will suit your home particularly well and even improve how it looks from the street, then don’t hold back! The right supplier of made-to-measure blinds will be prepared to offer you a quote based on the window’s measurements and the type of blinds you would like to install. If your home has a conservatory, then conservatory blinds are an excellent way to improve energy efficiency in the space, allowing you to use your conservatory all through the year. If you’re worried about the cold coming in through the glass, opt for blinds in thick materials which will prevent air currents from passing through or heat being lost through the glass panes. The Beautiful Blind Company is a family-run business in the North East specialising in made-to-measure window blinds and conservatory blinds. With our expertise and commitment to providing the best possible service on every installation, you’re certain to love the bespoke blinds you order from us. For more information or to request a free quote, call us today on 01642 688049 or visit the Beautiful Blind Company website.